Whatever the era, the traveler is always pulled between looking outward and in. Until recently, the printed page pulled people inward: commuters read the paper on the 8 AM from Scarsdale or people on ocean liners sat in steamer chairs and read novels. The latest pull inward is what Southwest’s flight attendants call “portable electronic devices,” phones, computers, tablets and game consoles. At first these were regulated or tolerated. But now, transportation companies cater to technology users. Mega Bus has free wi-fi and for an allegedly small fee, Southwest and other airlines will let you surf the web at 30,000 feet. Sometime soon, travelers may be pulled even more inward, if airlines allow in-flight phone calls. After sitting behind someone on a transcontinental flight in the 1980’s, who had more credit card points than sense and had to call everyone and say nothing, I am as eager for in-flight cell calls as I am for a rectal exam. Sleeping and reading are the two things that most often pull me away from watching the journey. On a recent bus trip from Albany to eastern Long Island, after waking up from a short nap, I decided to spend more time watching the trip. The height of a bus offers a better view of the roadside than a car. On the way home from Long Island, I got to see a beautiful old house on Long Island. Driving by the same place in the car, the view was obscured by a hedge. During the Megabus leg of the trip from Albany to Manhattan, streams, rivers and ponds along the Thruway were locked in ice. At other times of the years, these waters are open or moving, from the current or wind. But nothing says winter like white and cold-blue ice. Later, thoughts of Doctor Zhivago gave way to a moment from Larry McMurtry and The Last Picture Show. On the north side of Interstate 80, in Bogota, New Jersey, just west of the New Jersey Turnpike interchange, I saw a faded sign, painted on the side of a large building, announcing the “Queen Anne Theater.” The building was the right shape for a movie theater but no marquee was visible from the expressway. The building houses a dry cleaner; perhaps this business is enriched by spirits of romance and adventure from when black and white movies were shown, instead of starched shirts are boxed up. The Queen Anne theater observation shows something important about looking outward. The best view of building and sign are from the eastbound lane. If you are going west, the roadway is so low that the sign is not visible and it’s hard to see the outline of the theater. The main bus entrance to Manhattan is the Lincoln Tunnel. The highway comes over the top of the Palisades, an ancient volcanic ridge. As the bus comes through a cut in the Palisades, travelers can see a delightful panorama of midtown Manhattan and New York Harbor. From here, the Empire State Building looks skinny, as if it had competed in one of those events where people walk or run in stairwells to the Building’s observation deck. If you do not look fast enough, you miss the view as the bus spirals down and into the tunnel entrance. Before plunging into the tunnel this trip, I saw how Manhattan and the Harbor have remained constant in an ever-changing metropolis. Shipping and docks in Hoboken have been replaced by waterfront apartments. On the West Side of Manhattan, a new generation of skyscrapers will soon join the Freedom Tower. 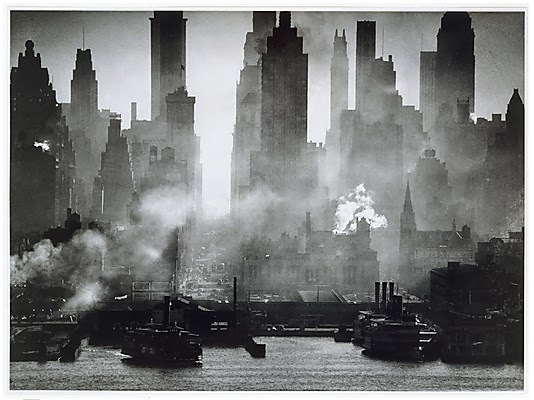 At the turn of the century and in the 1940’s, the painter George Bellows and photographer Andreas Feininger captured white steam rising from steam locomotives, power plants, cargo ships and ocean liners. 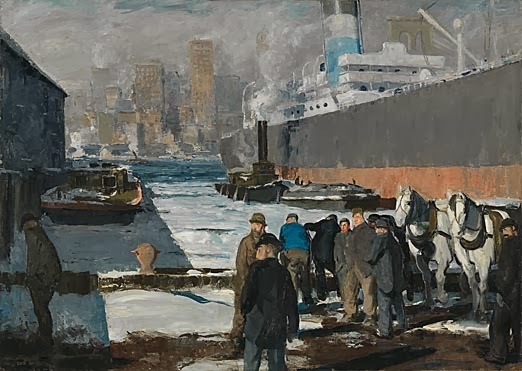 Working in oils and black-and-white, Bellows and Feininger each perfectly captured the hard, sharp quality of winter light and the simple, stripped down colors in the landscape. Most of the things that generated the steams in Bellows’ and Feininger’s times are gone, replaced by other, more modern things. If Bellows and Feininger came back to the edge of the Palisades today, they might mourn the departure of trains, cargo ships and ocean liners. But they would be happy to see that the City remain vital - - under the same hard, sharp light they saw.